The proximal femoral morphology of fossil hominins is routinely interpreted in terms of muscular topography and associated locomotor modes. However, the detailed correspondence between hard and soft tissue structures in the proximal femoral region of extant great apes is relatively unknown, because dissection protocols typically do not comprise in-depth osteological descriptions. 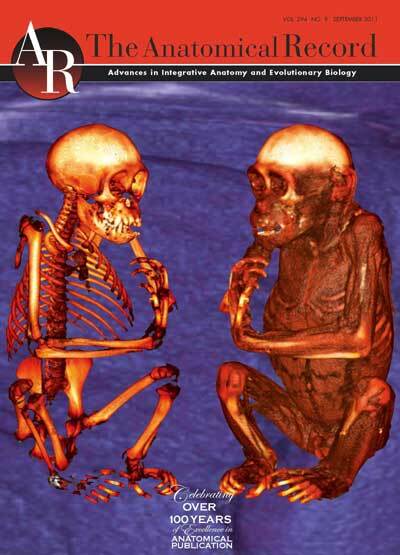 Here, we use computed tomography and virtopsy (virtual dissection) for non-invasive examination of the femoropelvic musculoskeletal anatomy in Pan troglodytes, P. paniscus, Gorilla gorilla, Pongo pygmaeus, and Homo sapiens. Specifically, we analyze the topographic relationship between muscle attachment sites and surface structures of the proximal femoral shaft such as the lateral spiral pilaster. Our results show that the origin of the vastus lateralis muscle is anterior to the insertion of gluteus maximus in all examined great ape specimens and humans. In gorillas and orangutans, the insertion of gluteus maximus is on the inferior (anterolateral) side of the lateral spiral pilaster. In chimpanzees, however, the maximus insertion is on its superior (posteromedial) side, similar to the situation in modern humans. These findings support the hypothesis that chimpanzees and humans exhibit a shared–derived musculoskeletal topography of the proximal femoral region, irrespective of their different locomotor modes, whereas gorillas and orangutans represent the primitive condition. Caution is thus warranted when inferring locomotor behavior from the surface topography of the proximal femur of fossil hominins, as the morphology of this region may contain a strong phyletic signal that tends to blur locomotor adaptation.